Approximately $954,000 worth of medication stolen. On May 3, 2018, at 8:29 P.M., Deputies responded to the Pilot Truck Stop located at 9211 Lewisburg Highway about stolen eighteen wheeler and cargo. Upon further inspection, it appears that the victim and the items had been surveilled. The victim stated that he had stopped to fuel his vehicle and when he returned from the store the truck was gone. The vehicle belonged to Arman Transport from Louisville, KY. The vehicle and contents were en route to Dothan Alabama. The trailer contained two pallets of approximately 1300 vials of Octagam, a medication used by cancer patients with an estimated value of $965,000. Through video, investigators were able to tell that what was believed to be a Red Volvo Semi truck and trailer followed the victim into the truck stop lot and a person got out of the Volvo and took the victims truck and trailer. The Volvo and the stolen vehicle then headed South on Interstate 65. 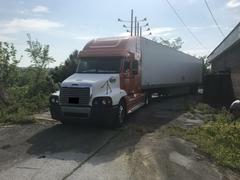 The stolen truck and trailer were located in Giles County on the morning of May 4, 2018. The contents of the trailer had been removed. The Giles County Sheriff’s Department is asking the public if anyone has seen any suspicious activity on May 3rd in the area of Frankewing around 9:30 P.M. The investigation continues with the assistance of several Federal agencies. A picture of the recovered truck and trailer is attached. If anyone has seen another truck and trailer with the one in the picture on the night of May 3, 2018, please call Investigators at the Giles County Sheriff's Department 931-363-3505.